Randy Finch's Film Blog: Will DMG, a Company With Major Mainland Chinese Connections, Get Approval to Buy Taiwan's Biggest TV Network? Will DMG, a Company With Major Mainland Chinese Connections, Get Approval to Buy Taiwan's Biggest TV Network? An item in the Nov. 21, 2015 LA Times confirms that Yinji Entertainment and Media (also known as DMG Entertainment) has made an offer of US$600 million to acquire EBC, Taiwan's top television network. That's the chairman of Yinji Entertainment and Media (also known as DMG Entertainment), Xiao Wen-ge pictured above. Whether Taiwanese regulators (specifically, the Investment Commission in Taiwan's Economic Affairs Ministry, the National Communications Commission of the Executive Yuan and the Taiwan Fair Trade Commission) will approve the deal depends on how they look upon Yinji Entertainment and Media's history - and its ownership. The power behind Yinji Entertainment and Media (aka DMG) is not the American "partner" frequently cited in Western news reports, Dan Mintz: It is Xiao Wen-ge (also known as Peter Xiao). Where does Peter Xiao and Yinji Entertainment and Media (aka DMG)'s money come from? Apparently Peter Xiao is a businessman with much financial acumen. For example, in November 2014, Peter Xiao engineered a reverse takeover deal whereby Sichuan Gaojin Food, a publicly-traded Chinese meat (mostly pork) processing company, issued new shares to the owners of Yinji Entertainment and Media Company (aka DMG) in exchange for a 100% stake in DMG. This move allowed DMG to go public without drawing too much regulatory scrutiny and (per The Hollywood Reporter) to jump "to the front of the line, as the Chinese government only recently started allowing IPOs again after 14 months in which the market went dark." Per the LA Times, the deal valued "DMG at $970 million...three times the value of Gaojin at the end of 2013" and more than three times the revenue of DMG in 2013. Xiao, who owned 91% of DMG before the transaction, ended up owning around 70% of Sichuan Gaojin Food as a result. This backdoor listing of Yinji Entertainment and Media left Peter Xiao worth approximately US$2.2 billion and with access to more capital from Chinese investors - who wanted a piece of his pork and media company. It's mostly on paper, but today (Nov. 22, 2015) Peter Xiao is one of China's richest men. So why does Peter Xiao want to own EBC? 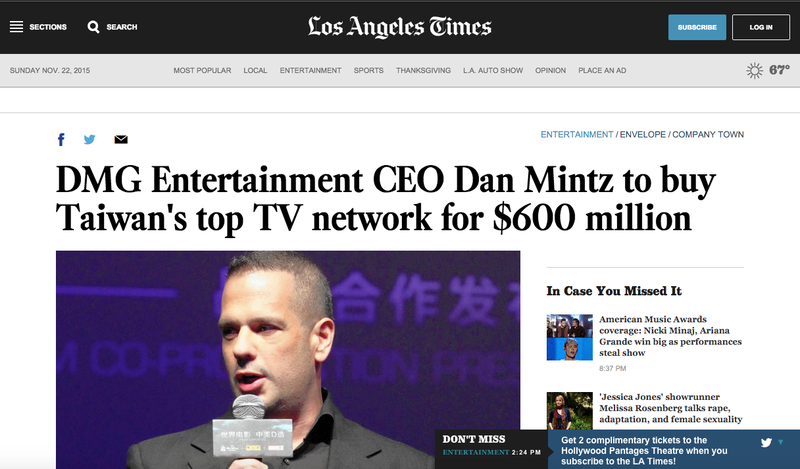 According to the LA Times: "EBC is the largest privately owned Mandarin-language TV network with 20 channels, including eight in Taiwan that show a mix of news, sports, movies, dramas and children's programs. EBC also is carried on cable and satellite services in North America and Europe, and has a subsidiary channel in South America. The network is widely viewed across Asia, including Hong Kong, Singapore and Malaysia." It looks as if Xiao Wen-ge wants an outlet for Mandarin content outside China - and he's willing to bet a large share of his company's wealth to get it. Is this just Xiao Wen-ge - or is there Chinese government interest in owning a large media company based in Taiwan - with viewers around the globe? And where exactly did DMG come from? DMG was founded in the early 1990s as a private Beijing advertising and commercial production firm by Xiao Wen-ge (as noted above, DMG's chairman and after the Sichuan Gaojin Food deal, #105 on the Forbes "China Rich List"), Dan Mintz and Wu Bing (a former national gymnastics champion). In recent years, with Dan Mintz handling much of the Hollywood-side of the business, DMG has morphed into a film production and entertainment conglomerate. The first many Westerners heard of DMG may have been when the company backed Rian Johnson’s “Looper” - that was distributed by Sony in 2012. Then, in 2013, DMG co-financed Iron Man 3 - the highest-grossing movie of that year with $1.2 billion at the box office - although the box office in China for Iron Man 3 was disappointing (around US$120 million). After the Sichuan Gaojin Food deal in late 2014, DMG has rapidly begun making more moves - acquiring independent comic book publisher Valiant early in 2015 with what the NY Times reported as a 9 figure investment, with plans for films and TV for a global audience as well as "Chinese-language publishing, animation and theme parks, as well as toys and apparel." In 2015, DMG is also co-producing a remake of the surfer crime drama “Point Break” with Warners. The Western media typically features Dan Mintz, an American, when discussing DMG. And Dan Mintz is listed as DMG's CEO. But, according to regulatory filings there is no doubt that Peter Xiao Wen-ge is DMG’s chairman and biggest shareholder. And Variety has observed that DMG benefits from "strong connections" with Chinese government officials and the state-run film enterprise China Film Group Corporation. So will the Taiwanese regulators approve the DMG EBC deal? UPDATE: Nov. 25th, 2015 I've just read a fascinating Nov. 23rd, 2015 post to Thinking Taiwan by J. Michael Cole that covers much of the same ground I've examined in this post... but J. Michael Cole also shares the following intriguing information about Xiao Wen-ge's father, Xiao Jinguang (肖勁光, a.k.a. Xiao Yucheng [蕭玉成] a.k.a. Man Ge [滿哥]): Apparently Xiao Jinguang (who died in 1989) "was one of the ten senior commanders of the PLA." The news that Xiao Wen-ge's father was Deputy Secretary of Defense from 1954 to 1982 (throughout the Cultural Revolution) and Vice Chairman of the Fifth National People’s Congress Standing Committee from 1979-1983 may help explain why his son has risen to a privileged spot amongst China's current crop of billionaire media moguls.